The conversation plays out across the office in the weeks leading up to all the Of The Year competitions. The question comes from all angles: from video producers, art directors, fellow judges, non-participating editors, photographers—even the honchos in corporate. 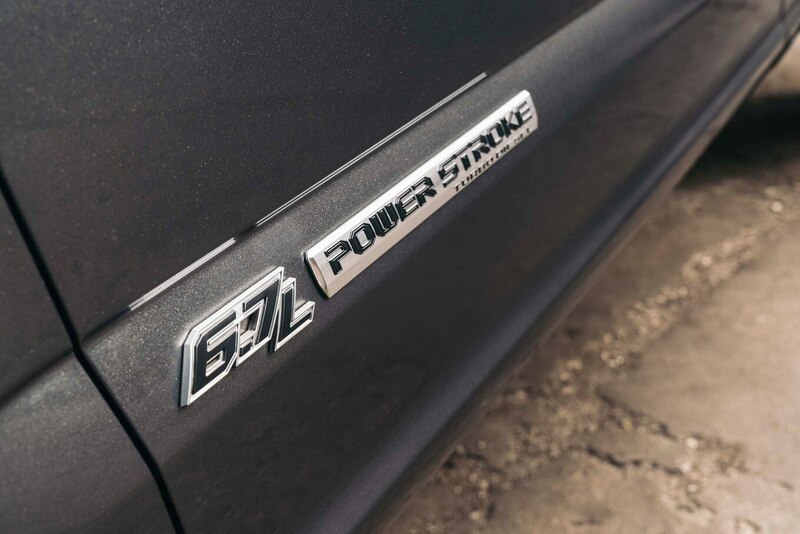 We have been thinking about this topic ever since we saw the official invite list of vehicles, sometimes since the launch of a particularly impressive vehicle earlier in the year. We all have our favorites, but it’s our thorough regimen of testing that truly determines the winner. 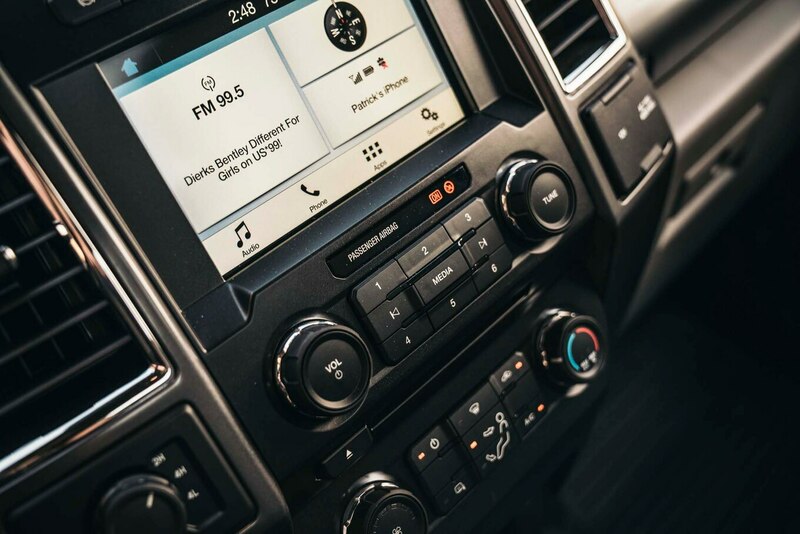 Nowhere are those numbers more important than for Truck of the Year. An Of The Year contest plays out one of three ways: There’s no clear winner right up to the end; there are two to three potential winners and a nail-biting vote; or there’s a clear winner early on and the rest becomes a coronation. 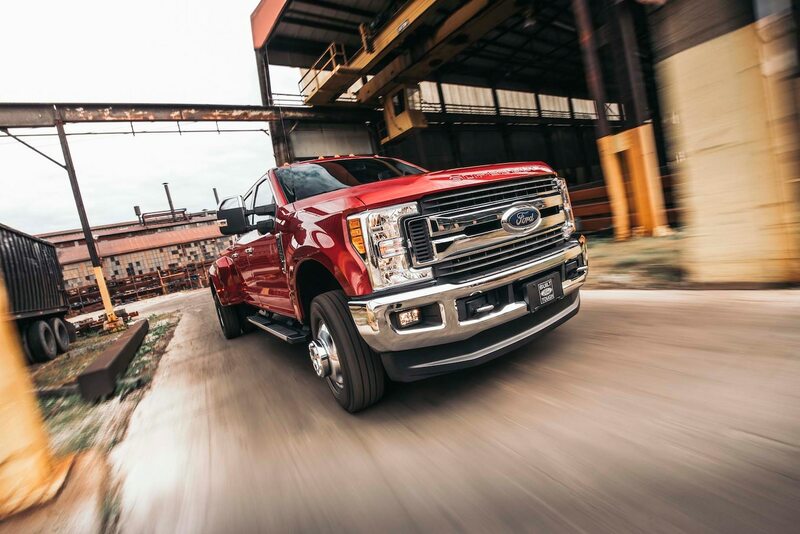 In this year’s Truck of the Year competition, we knew by the halfway point which truck would win. 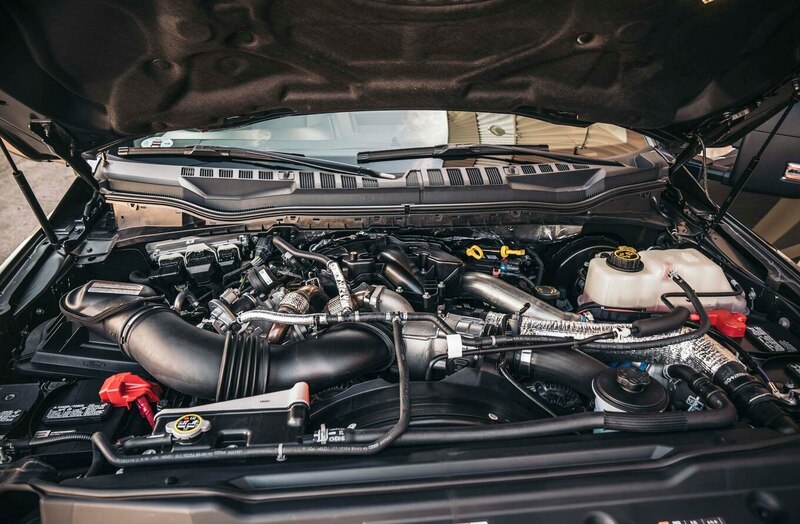 Sometimes, one vehicle so clearly satisfies or exceeds our criteria that we spend more time looking for faults than attributes, just to be sure we haven’t gotten ahead of ourselves. In this year’s field, the Ford Super Duty trucks emerged as the intuitive choice, one that had to be scrutinized, analyzed, and picked apart in subsequent days of testing. Some competitors rose in standing in the course of our evaluations, but none so much that the Super Duties needed to sweat. Indeed, the Fords’ ability to remain cool under our extreme pressure, regardless of the circumstances, made it all the more clear they deserved this award. Although design is inherently subjective, there are many ways in which to objectively judge it. Is it cohesive? 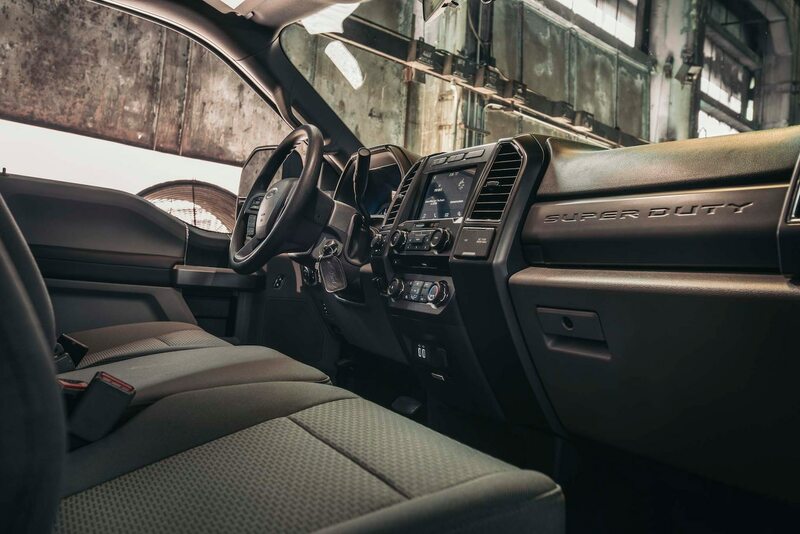 That is, do all exterior and interior aspects of the vehicle relate to one another? Do all the individual elements of the design serve a purpose, and do they advance the design as a whole? Does the design separate the vehicle from the competition, and does it speak to its intended market? 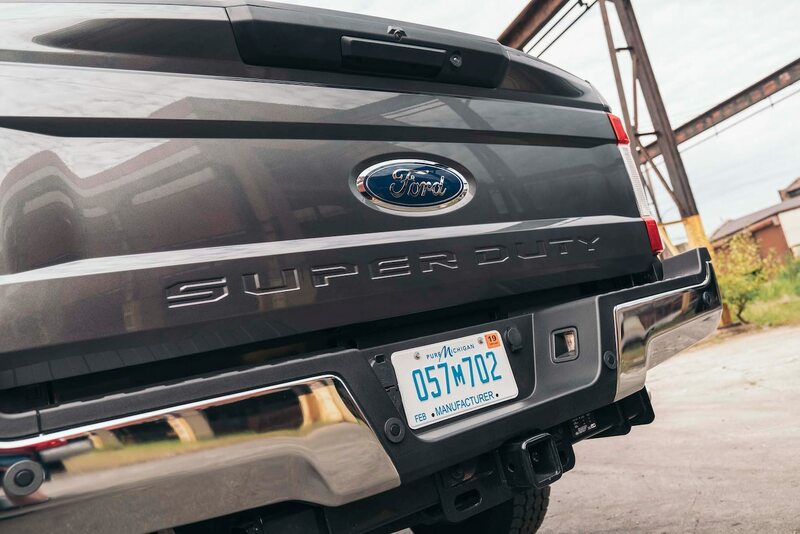 The Ford Super Duties answer all these questions in the affirmative. 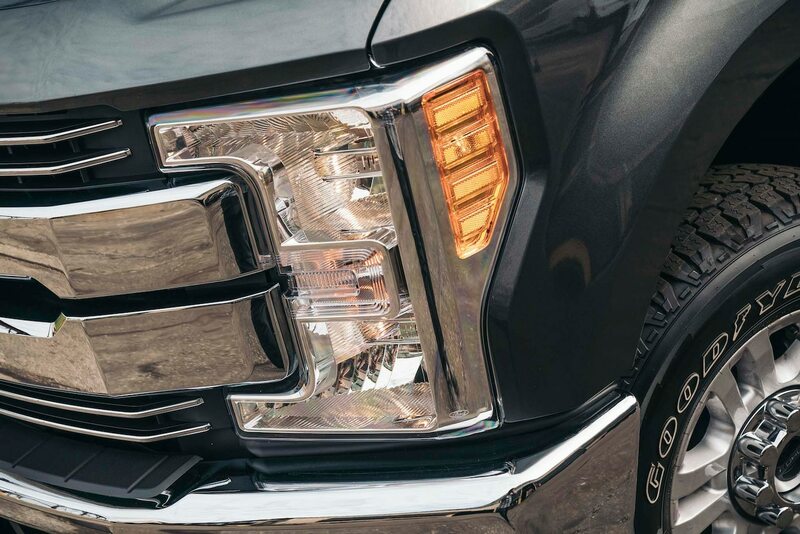 By their utilitarian nature, trucks can be inherently hard to differentiate. 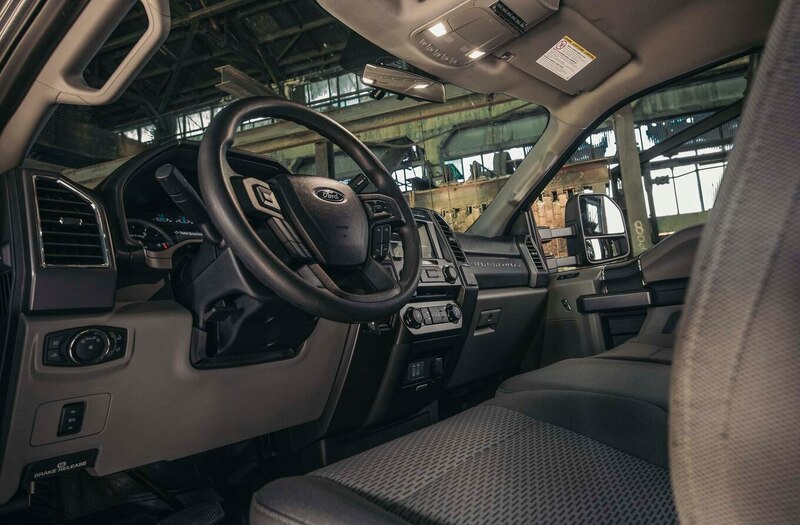 Get too creative, and you risk impinging on the vehicle’s ability to get the job done—and for the working professional, that’s what matters at the end of the day. Clunky but proficient wins over gorgeous and inefficient. 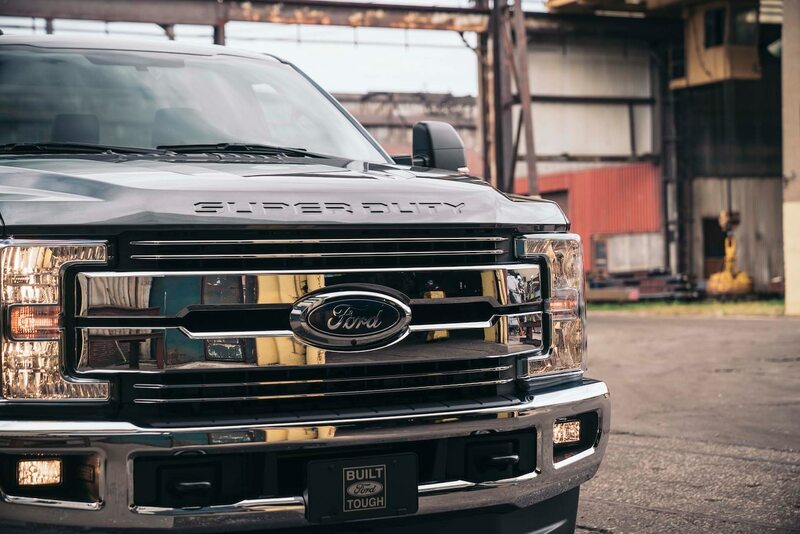 The Ford Super Duties strike this balance expertly, looking like no other truck on the road while keeping the customer mission front of mind. 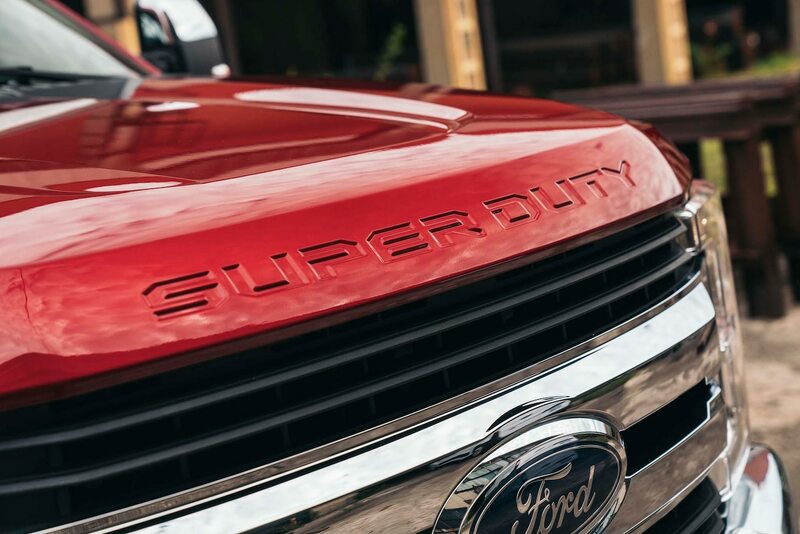 They are clearly and distinctly Ford Super Duties seen from afar, and the design doesn’t break down the closer you look. Although the design is busy in places, there is an obvious vision that has been executed. Every panel relates to the one next to it, even around corners, and every line serves a purpose. Critically, the design as a whole advances the direction of the previous generation without losing or abandoning its signature. 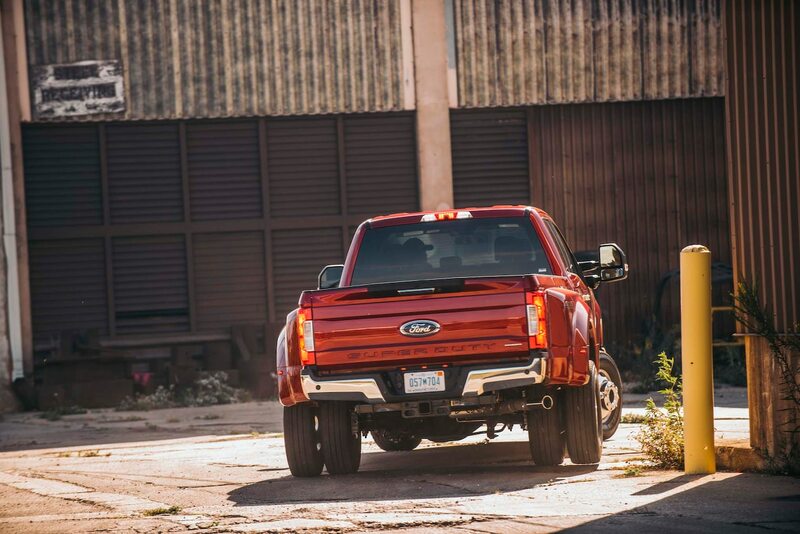 From every angle, there is no mistaking this truck for anything but a Ford. 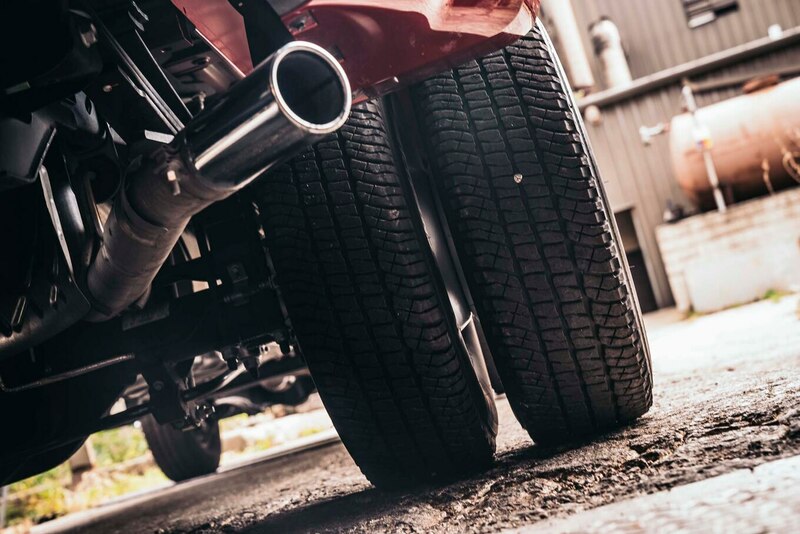 Vehicles of this size—or, more specifically, this weight—are not rated by EPA. 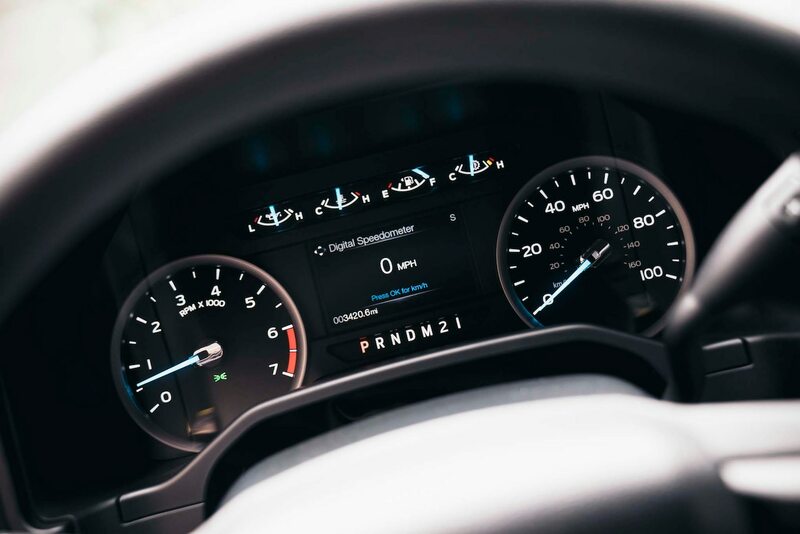 Thankfully, we have our own means of evaluating fuel efficiency thanks to our partners at Emissions Analytics. 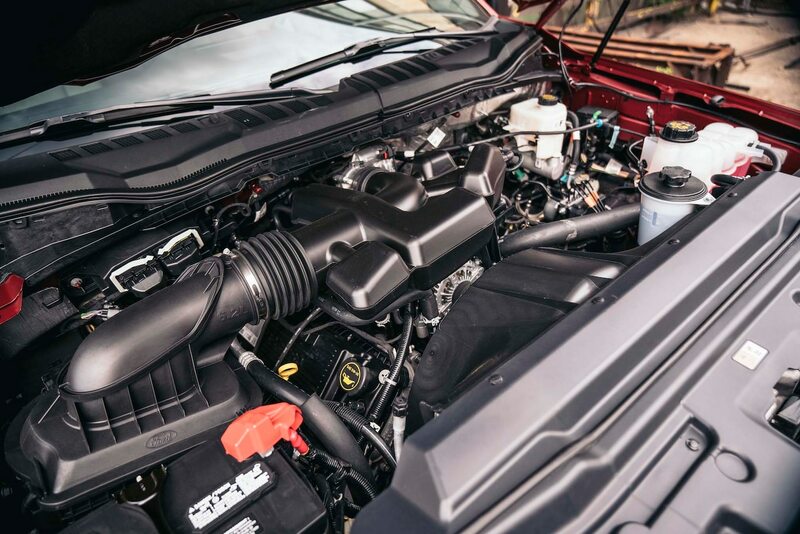 Subjected to our Real MPG testing regimen, the Ford Super Duties, in all configurations, handily outperformed the equivalent Ram trucks. 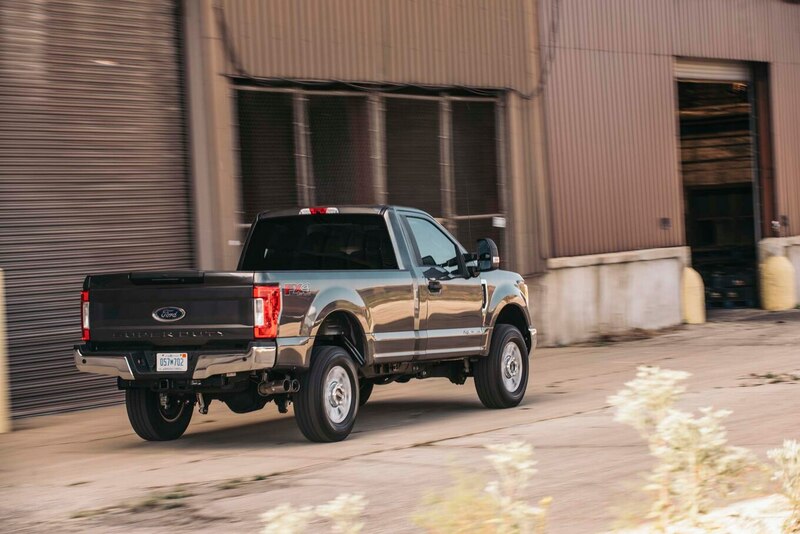 Given the gasoline-powered F-250 weighs some 400 pounds (181.4 kg) less than the gasoline-powered Ram 2500 with similar equipment, we expected a fuel economy advantage and were not surprised to see the Ford return 11/16/12.9 mpg (21.4/14.7/18.2 L/100km) city/highway/combined versus the Ram’s 9/15/11 (26.1/15.7/21.4 L/100km). 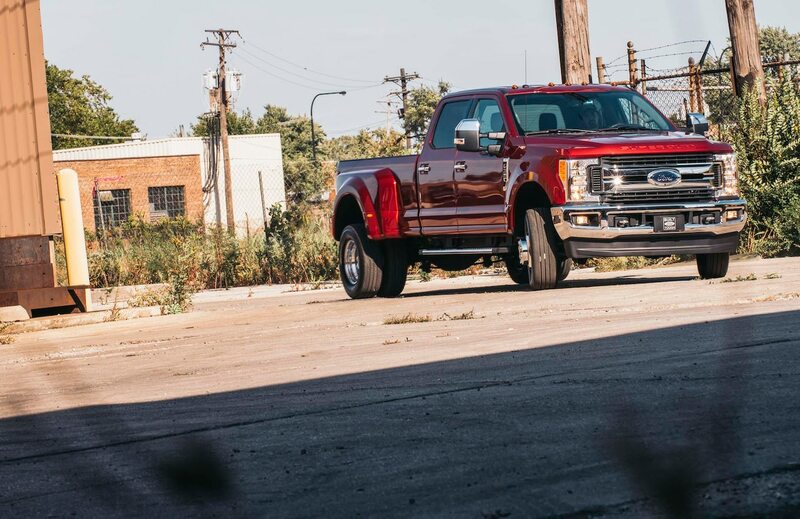 We were far more impressed with the performance of the F-350 dual-rear-wheel diesel. 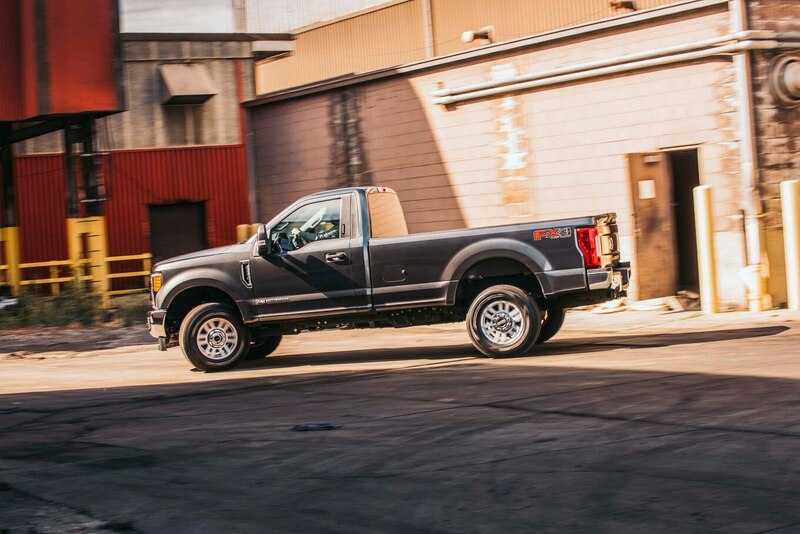 Despite weighing in at 8,643 pounds (3920.4 kg)—15 pounds (6.8 kg) heavier than the Ram 3500 dual-rear-wheel diesel—the F-350 returned an outstanding 16/20/18 mpg (14.7/11.8/13.1L/100km) city/highway/combined. 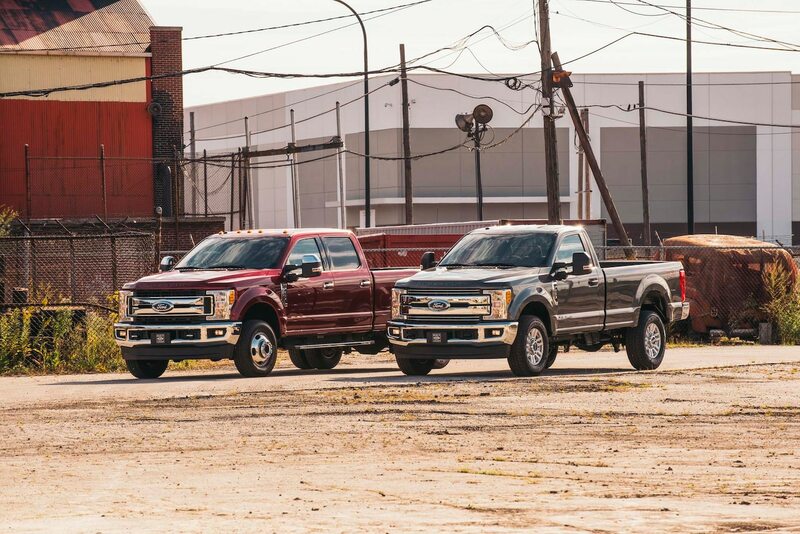 Excellent in its own right, the F-350’s result is all the more impressive compared against the Ram 3500 dually’s 13/17/14.8 (18.1/13.8/15.9L/100km) result. 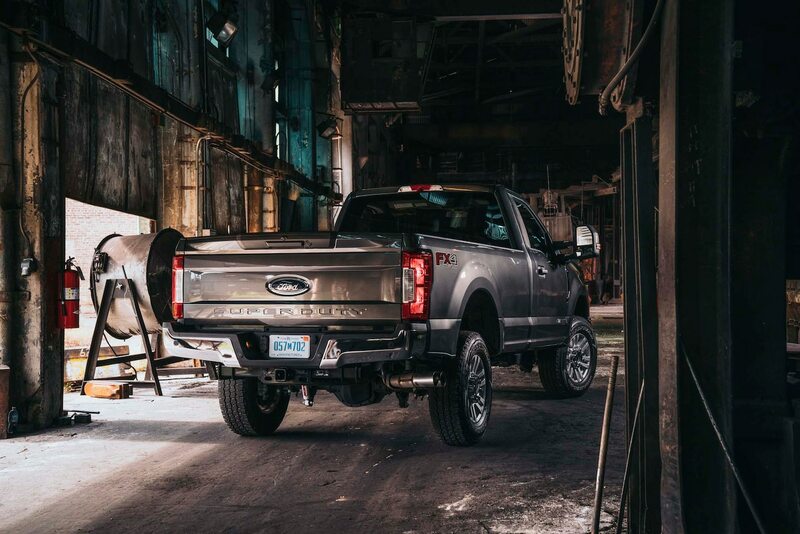 Did we mention class-leading torque and towing/payload capability? 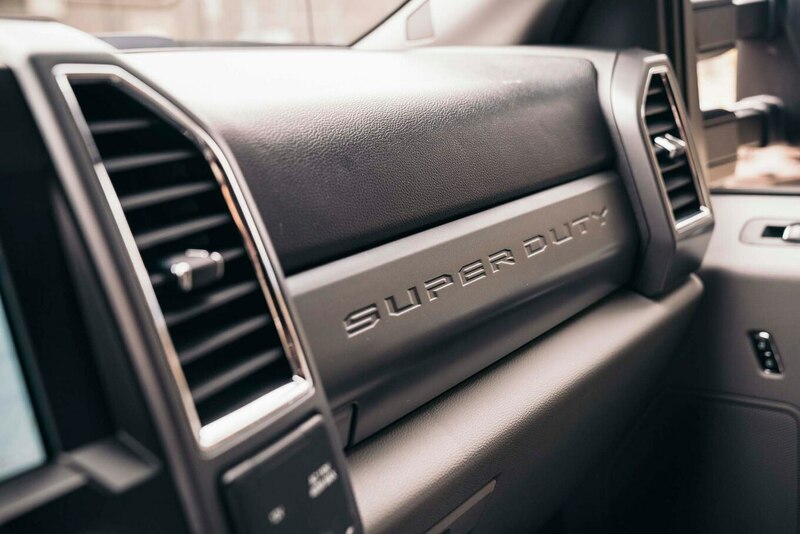 Although there are strong arguments to be made for technological advancement and environmental protection, the Super Duties’ efficiency will most resonate with customers at the pump. 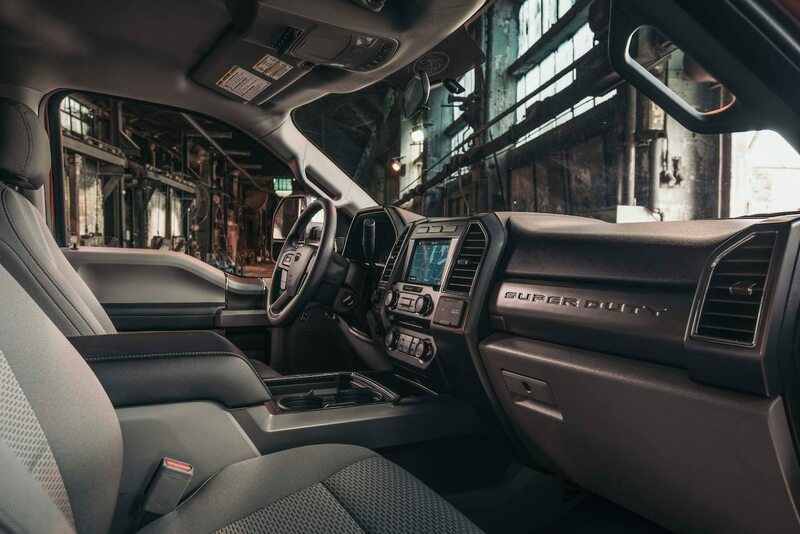 Given these trucks do more physical labor than any other class of non-commercial vehicle, the Super Duties’ advantages in efficiency will be a boon to working professionals balancing running costs with needed capability. 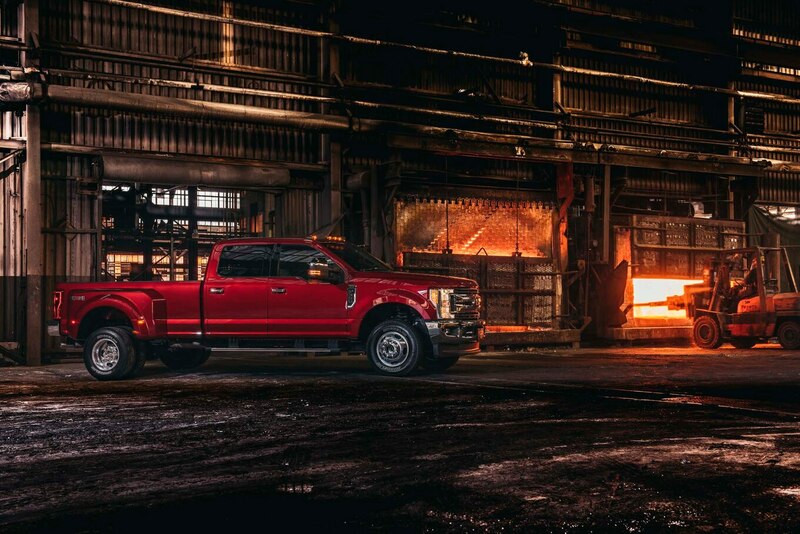 Ford truck ads tout the Super Duty’s class-leading 32,500-pound towing capacity. 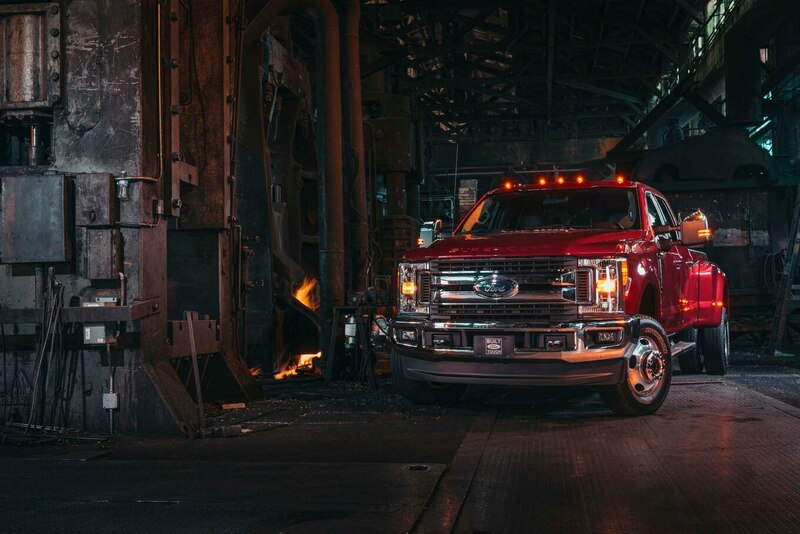 (Capabilities of the new Chevrolet Silverado HD had not been announced as of this writing.) That’s impressive. 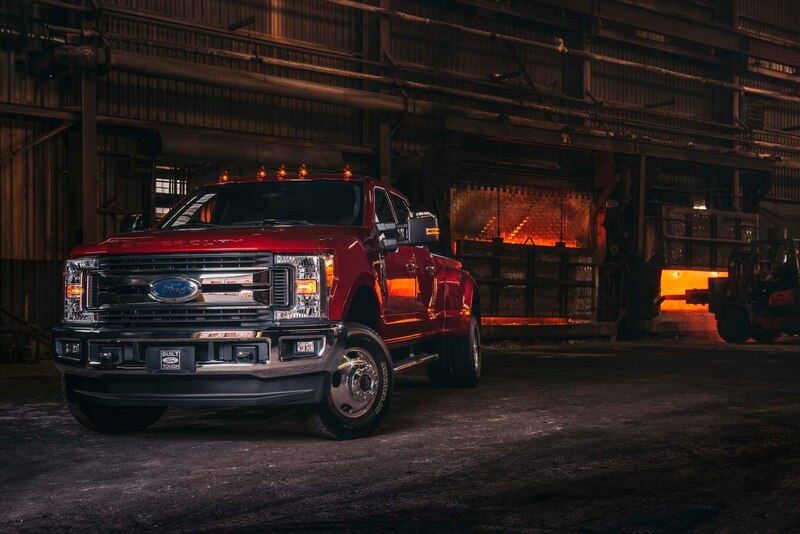 Equally so is the Super Duty’s also-class-leading 7,630-pound maximum payload capacity. 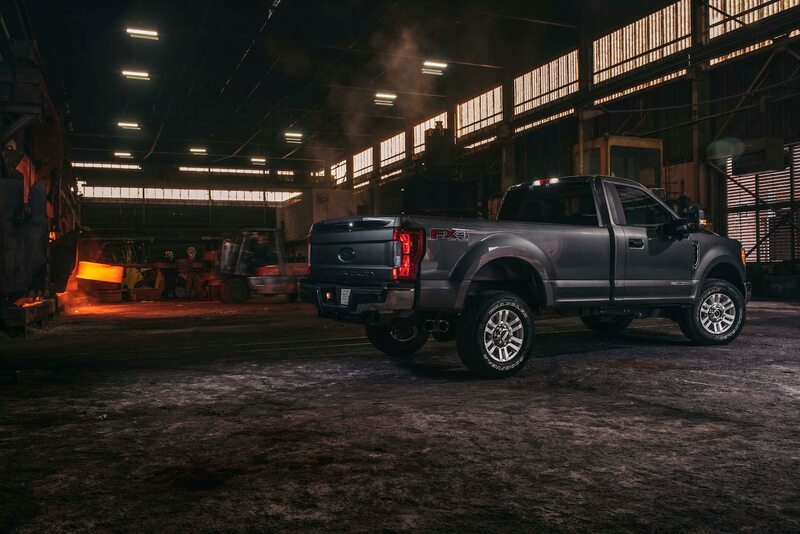 What the ads don’t tell you is how the truck actually behaves with 16 tons burdening the rear axle. 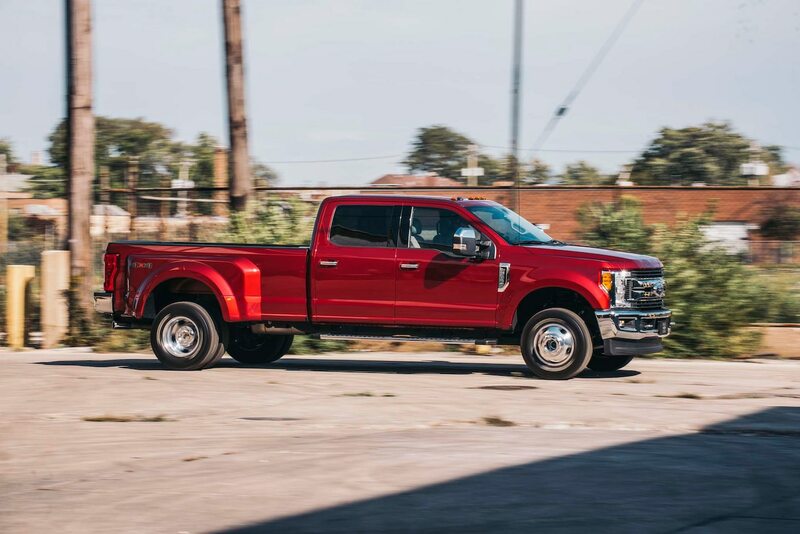 With a class-leading 925 lb-ft of torque on tap, the F-350 Super Duty will begin rolling forward at idle when you release the brake despite a gross combined vehicle weight of more than 40,000 pounds (18143.7 kg). 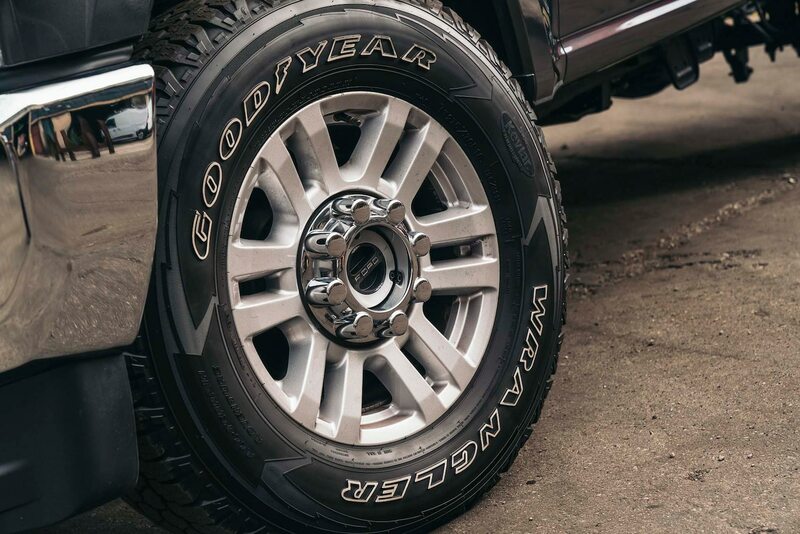 That’s simply stunning torque. From there, it’s a strong, steady pull to freeway speeds. 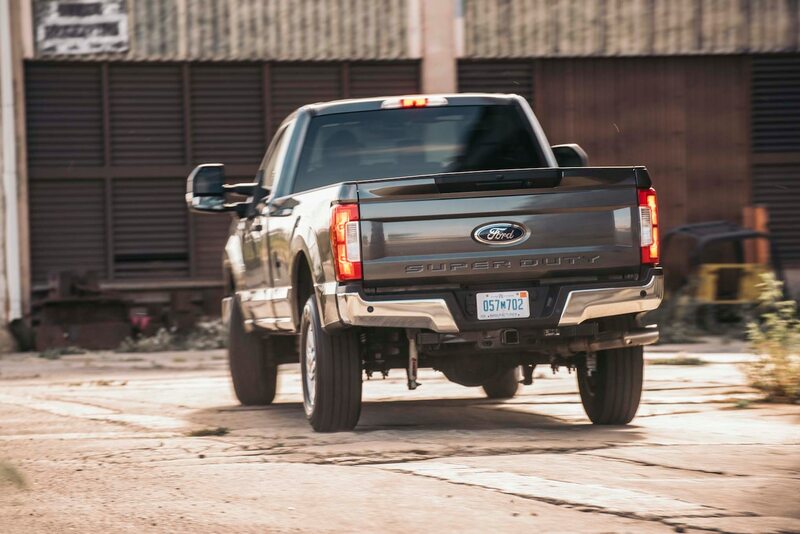 Braking from such speeds is handled with confidence, thanks to a powerful exhaust brake, well-calibrated Tow/Haul mode, and strong 14-inch rotors front and rear. 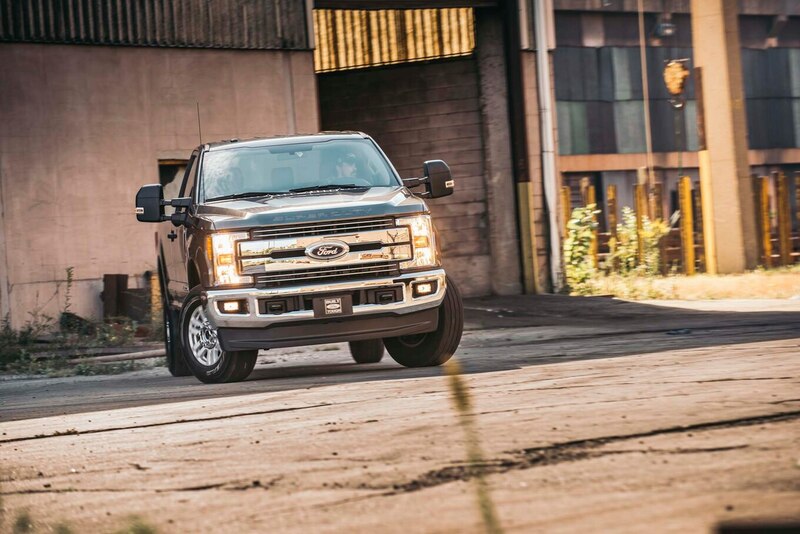 We had the luxury in this test of having the Super Duty’s most direct competitor on hand, and it proved instructive. 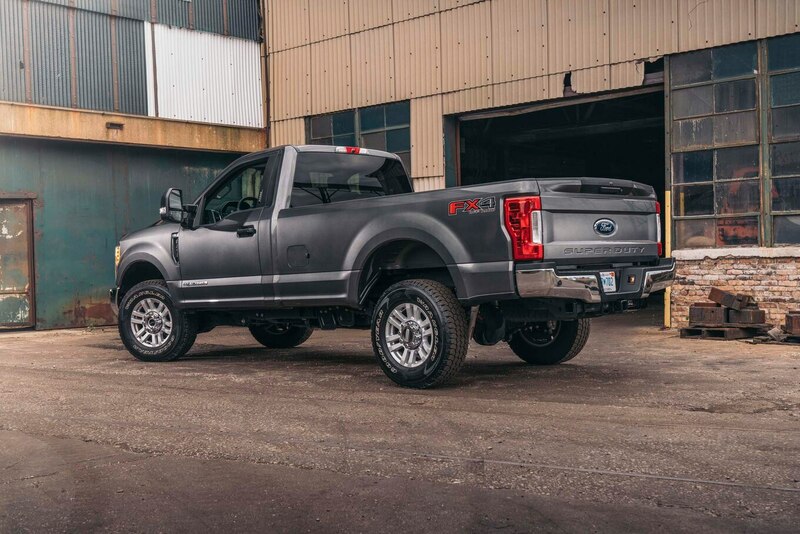 The Super Duties accelerated quicker and smoother than their Ram Heavy Duty rivals, braked comparably well, and handled better both on the skidpad and the figure eight. 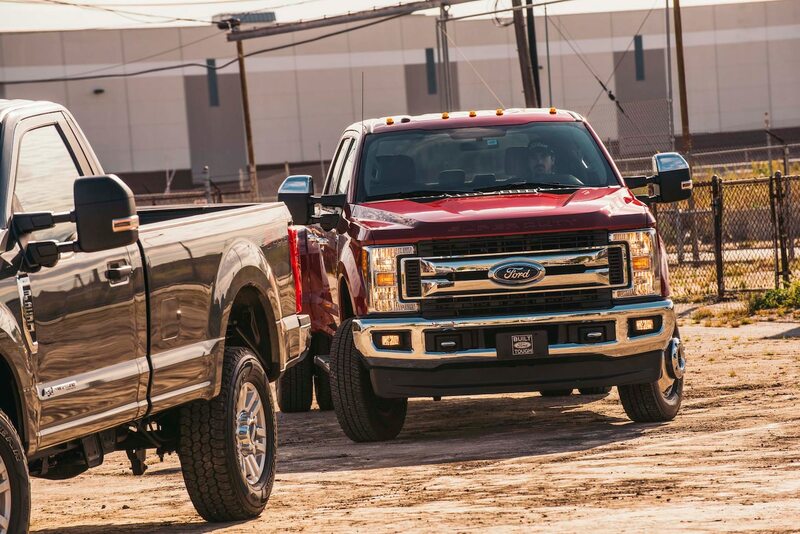 Towing at near max capability, the F-350 felt less burdened and accelerated quicker and smoother than the Ram 3500. 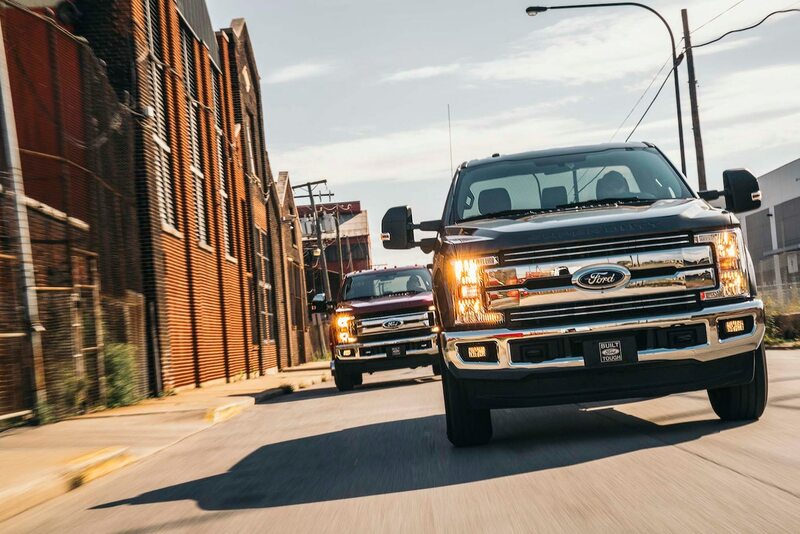 In a trailering slalom test, the F-350 with trailer was able to carry considerably more speed than the Ram 3500 and experienced less body roll—increasing driver confidence. 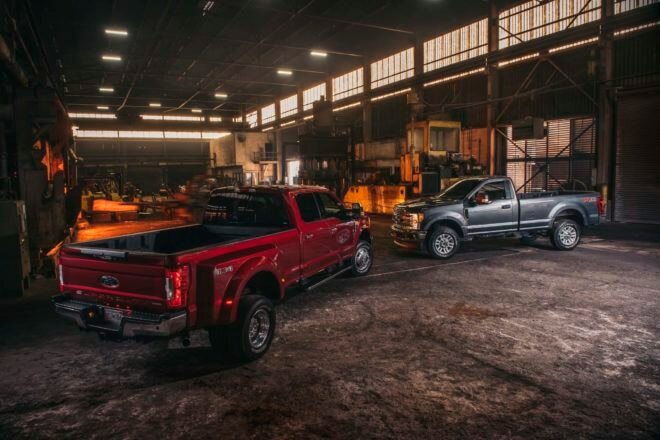 The same held true when comparing the gasoline-powered F-250 to the gasoline-powered Ram 2500. 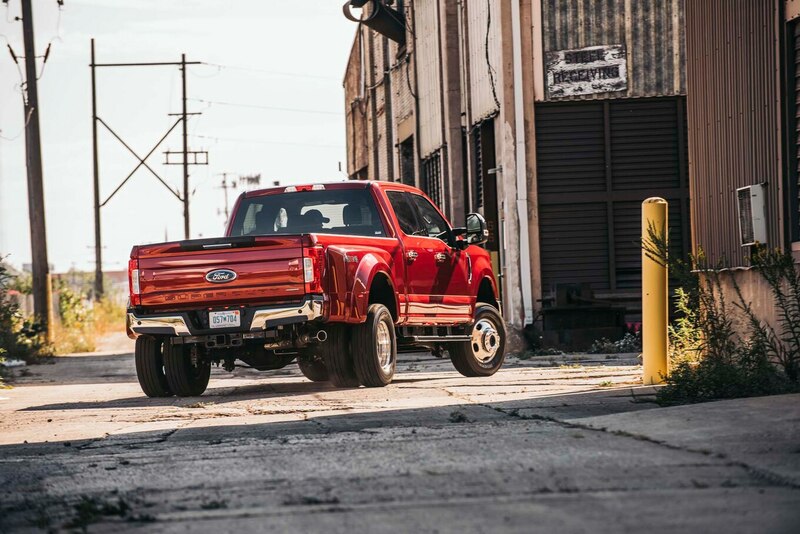 On the topic of the gasoline-powered trucks, it should be noted the F-250’s aluminum body helped it save 400 pounds (181.4 kg) relative to the Ram. 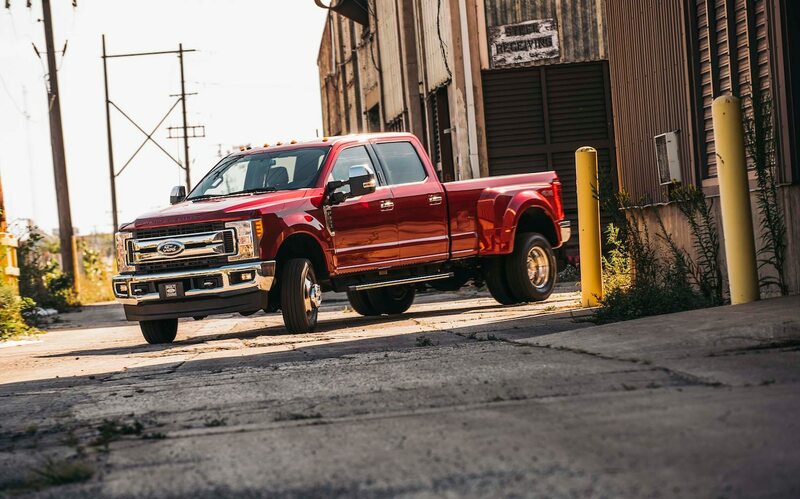 The F-350 actually weighs more than the Ram 3500, which Ford attributes to the reinforcements necessary to tow 16 tons. 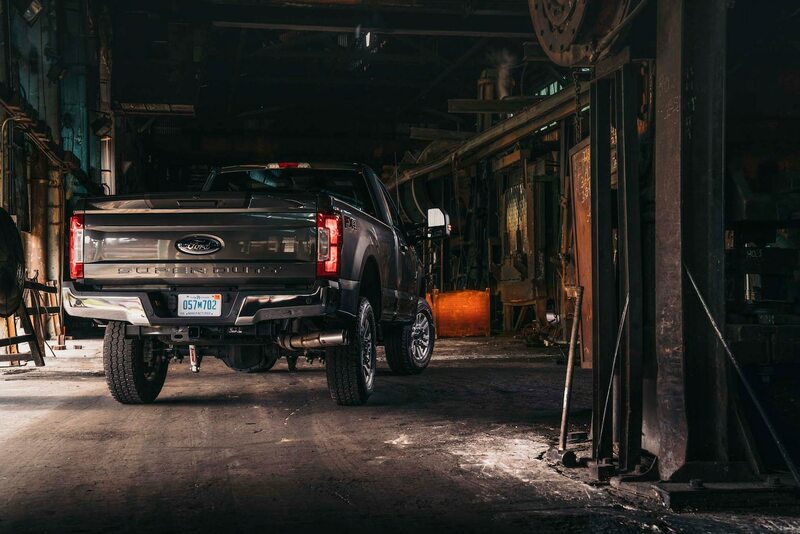 The Fords’ advantage became inescapable as we transitioned to a real-world test—towing about 7,500 pounds (3401.9 kg) of skid loader up the grueling Davis Dam grade. 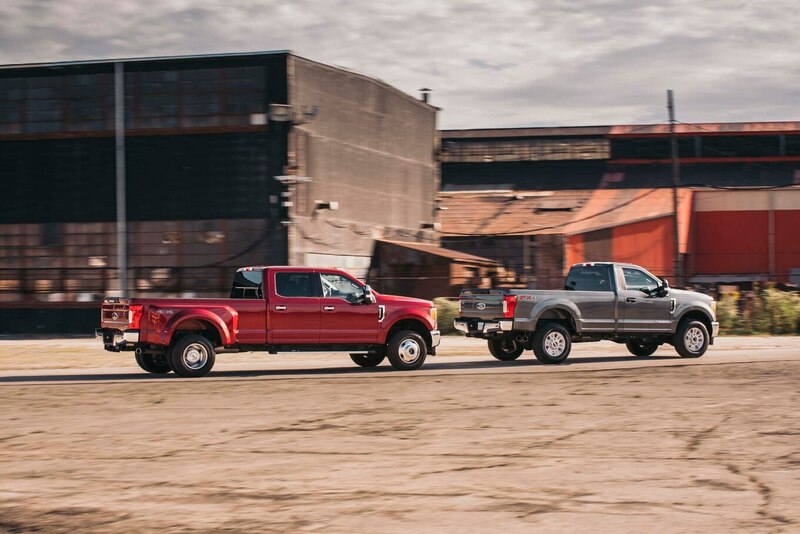 In a 35–55-mph (56.3-88.5 km/h) uphill passing test, both gasoline- and diesel-powered Ford models clobbered the equivalent Rams in both passing time and distance. Of course, no vehicle is perfect, and we’d be remiss if we didn’t call out areas for improvement. 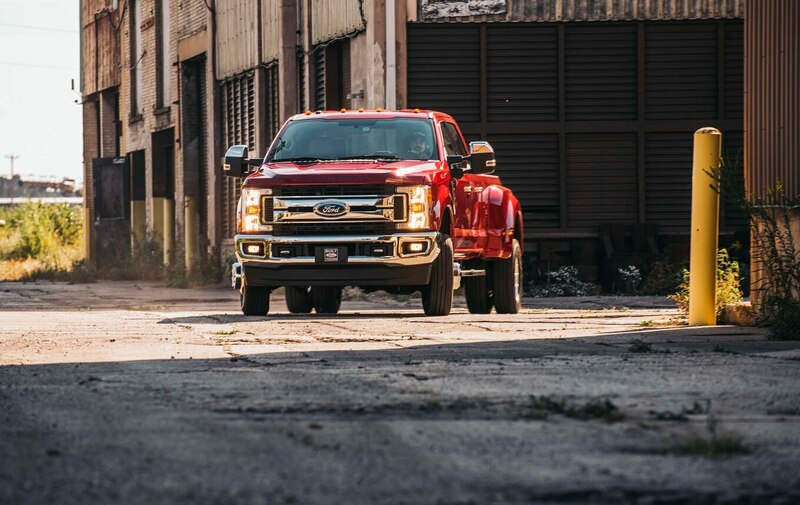 The gasoline-powered F-250 goes light on the nose when towing uphill, which makes it prone to tramlining—requiring more driver attentiveness. 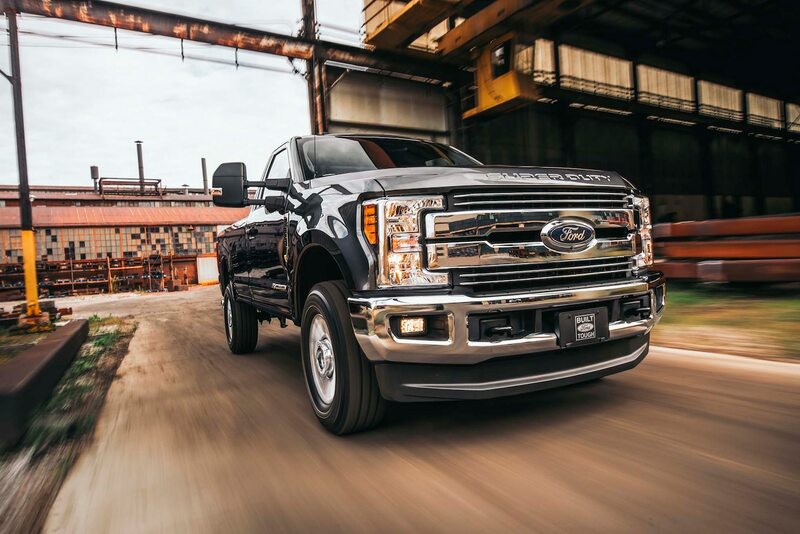 Also, on one occasion, the diesel-powered F-250, under cruise control, gasped in the heat and failed to maintain its uphill speed despite having adequate power to do so. 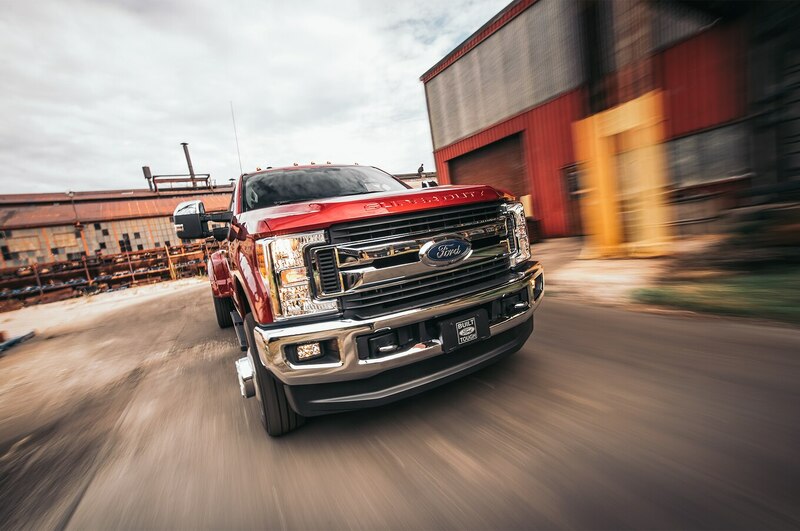 Lastly, all three Ford Super Duty trucks were prone to moderate bump steer on especially bad pavement and expansion joints. “I’m not sure I’ve ever evaluated another vehicle that hits this criteria so hard,” Jonny Lieberman said. None of us argued the point. 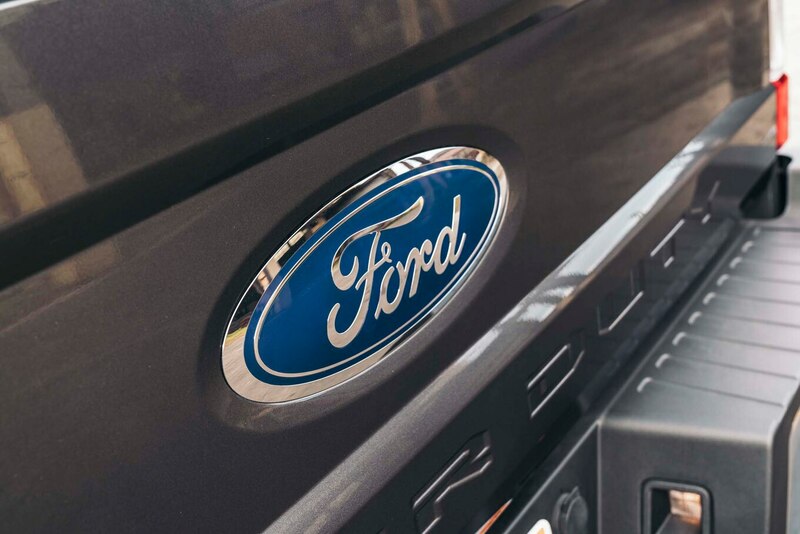 Ford has spent an enormous amount of time researching its customers’ needs and wants and finding clever engineering solutions. 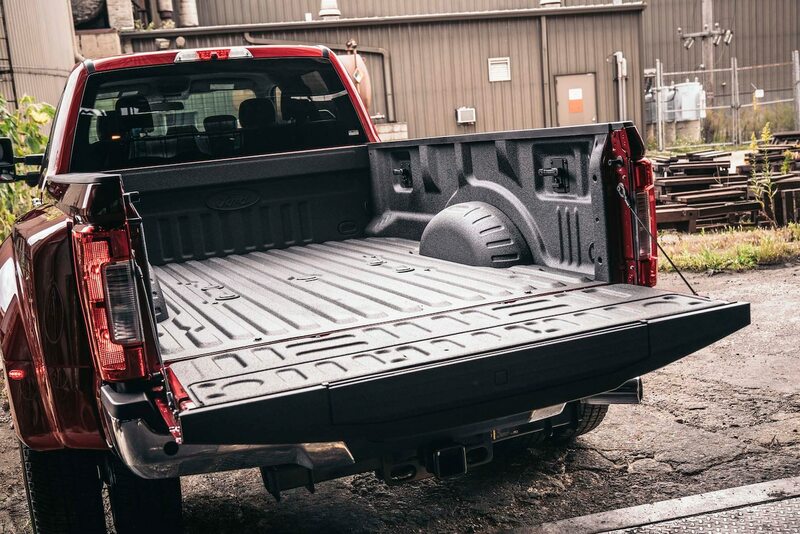 We know from industry research data that the vast majority of heavy-duty truck customers aren’t weekend cowboys. 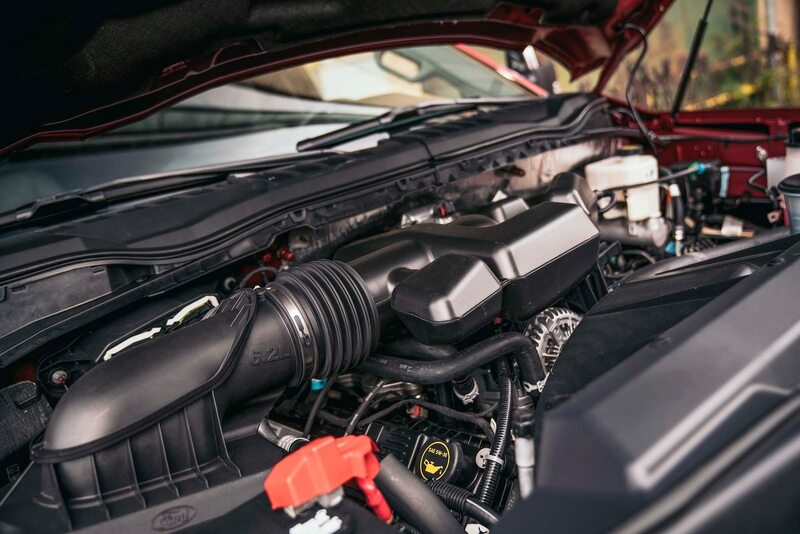 Capability and usability are king, and Ford has delivered on both. 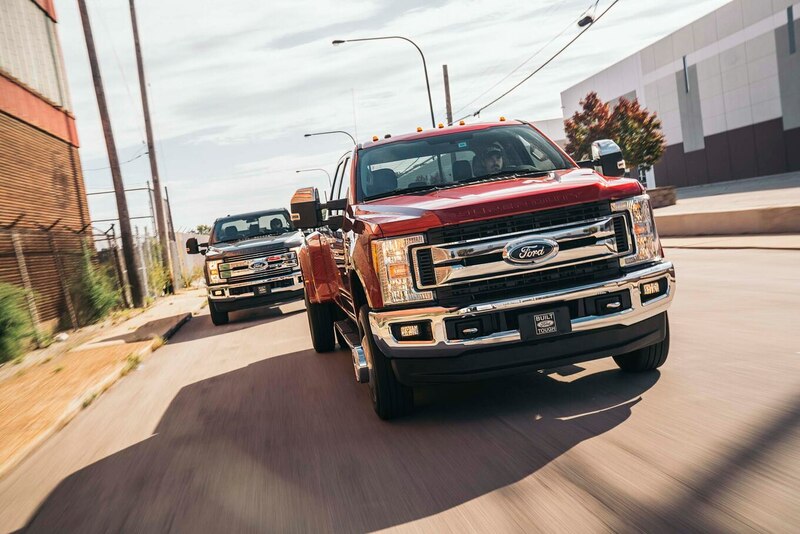 In addition to the trucks’ towing and hauling performances, judges were highly impressed with the suite of work-focused technologies baked into the Super Duties. 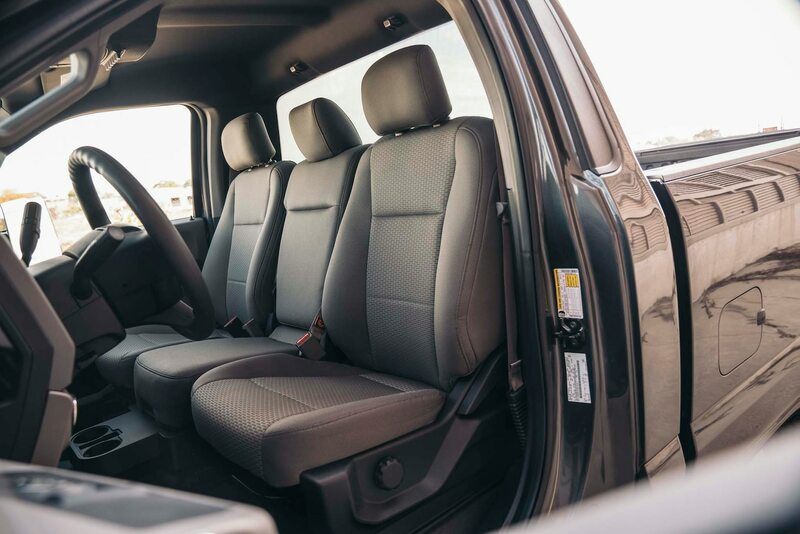 Although most folks who drive heavy-duty trucks are everyday pros, we noticed the Ford assistance features best helped rookies and those rusty in trailering. 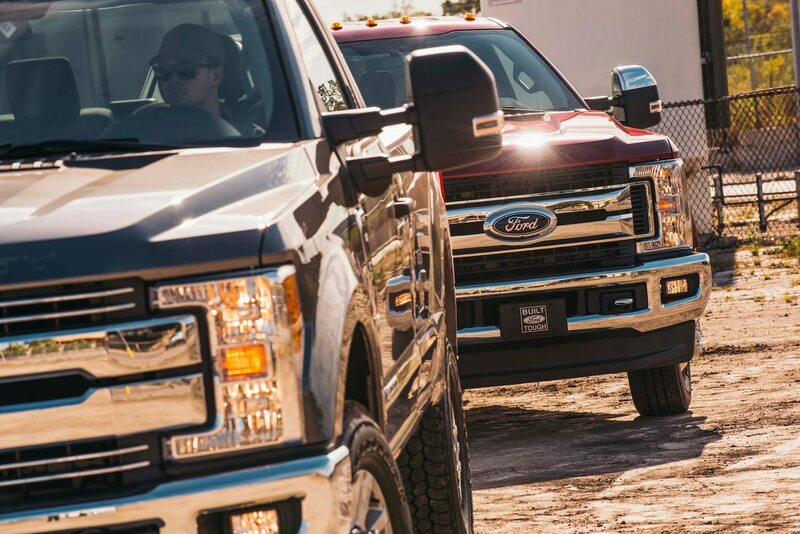 Heavy-duty truck customers aren’t weekend cowboys. Capability and usability are king. 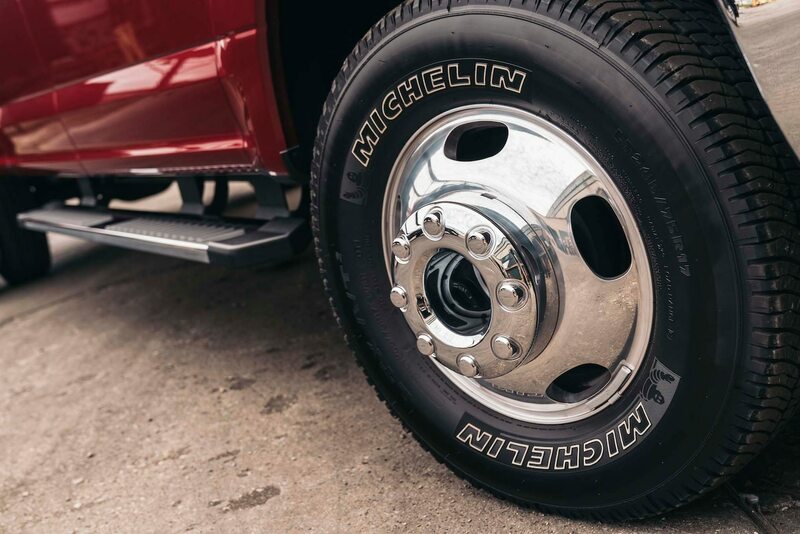 The ability to extend blind-spot detection to cover a trailer adds an important layer of safety, as does the ability to monitor six trailer tires’ pressures and the trailer lights on the dashboard. 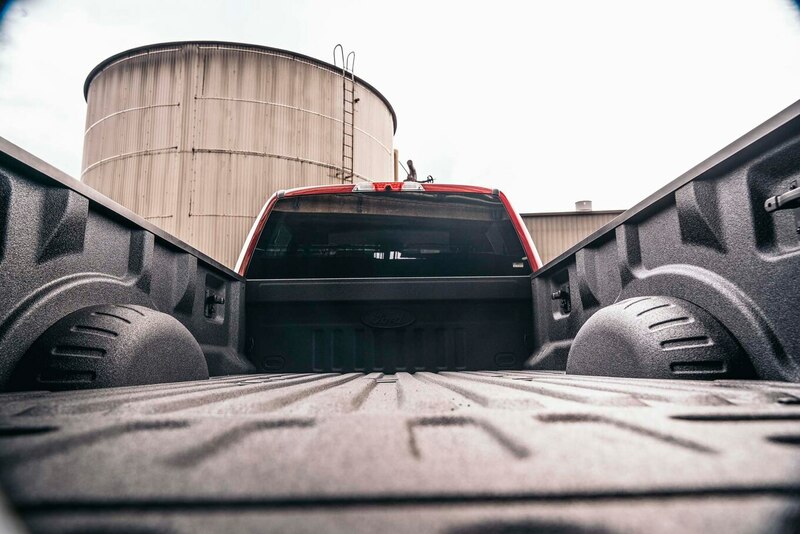 Its 360-degree camera coverage greatly aides maneuvering in close quarters, as do forward- and rear-looking cameras. 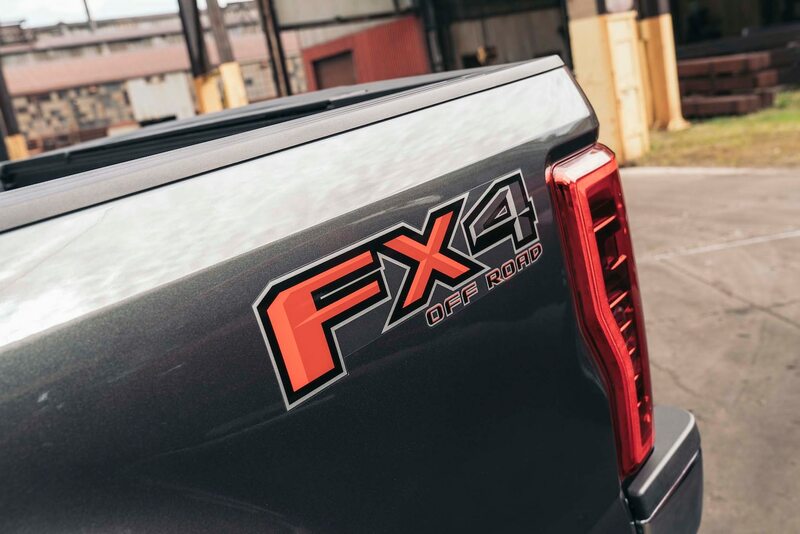 An additional camera mounted above the rear window, as well as the ability to zoom both this camera and the tailgate-mounted backup camera, makes connecting to a trailer a breeze for one person—be it a receiver hitch, gooseneck, or fifth wheel. 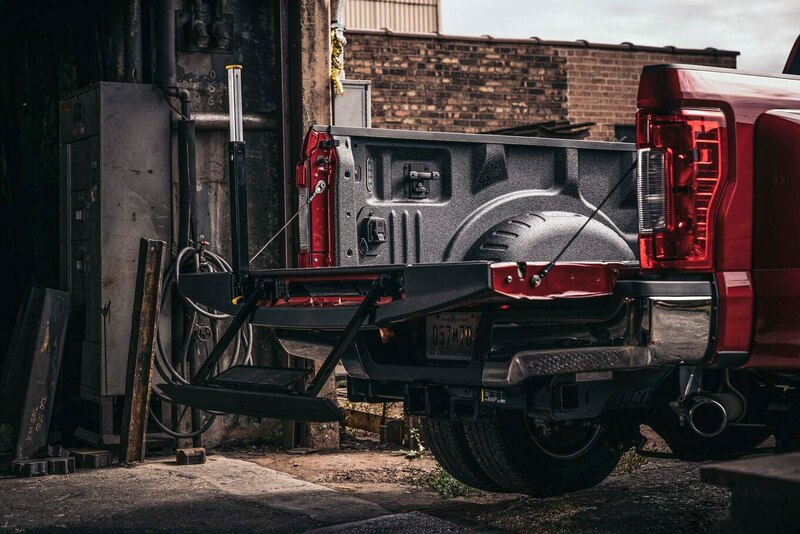 A dash-mounted tailgate release saves time and effort when attaching a gooseneck or fifth wheel and when loading or unloading. 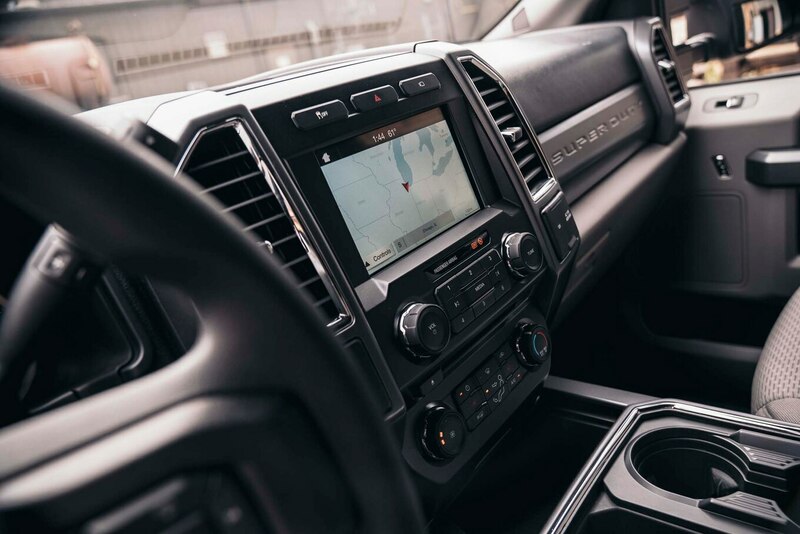 The ability to add an additional wired backup camera to a trailer and display it on the center console is enormously helpful, as is the trailer-backing guidance with jackknife warning. 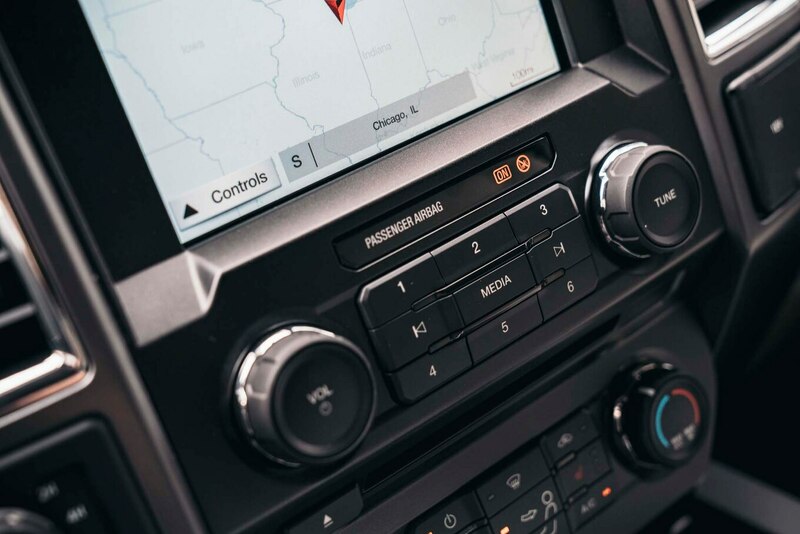 Judges also gave the Super Duties high marks for the inclusion of four 25-amp and two 40-amp auxiliary switches, ready to be connected to power takeoffs and other equipment. 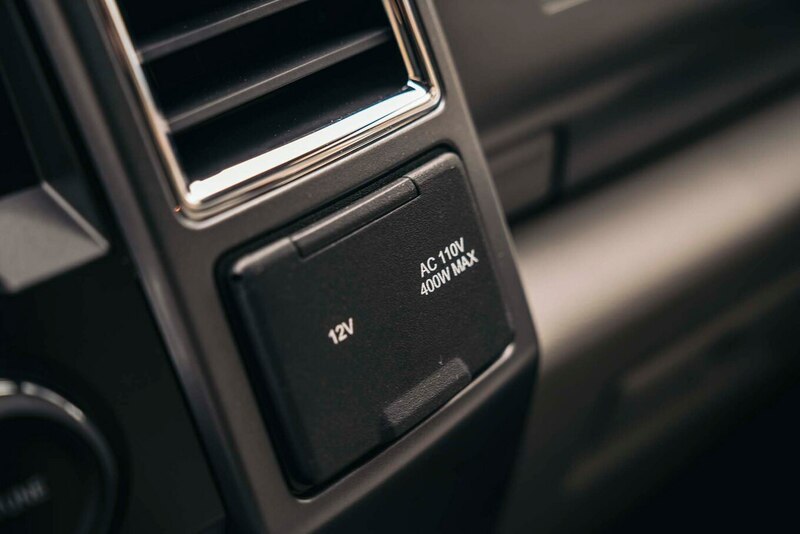 We also appreciated the available 400-watt power inverter and two available 110-volt power outlets for charging tools, computers, and more. Staff needing to move equipment during our test program also appreciated the flat rear floor and easily stowed under-seat storage system. 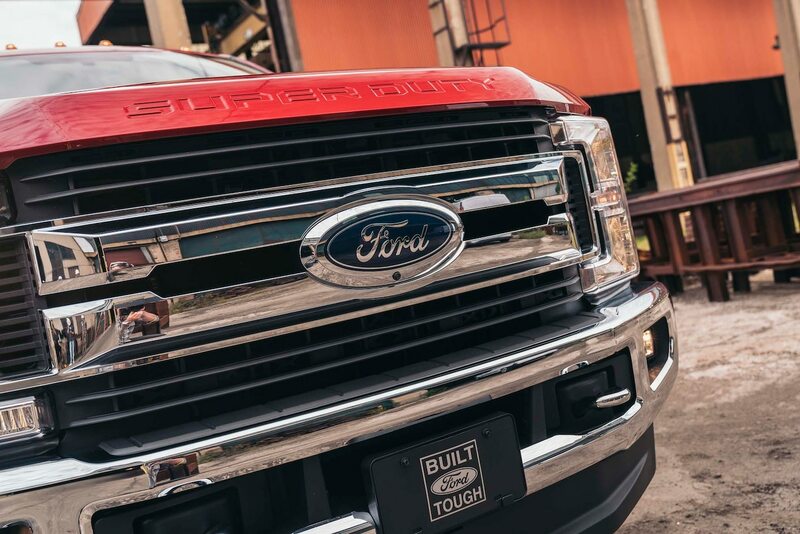 The 2017 Ford Super Duties had not yet been rated by either the Insurance Institute for Highway Safety or the National Highway Traffic Safety Administration. However, we expect them to perform well because of the strengthened frame. Of course, we prefer a vehicle capable enough to avoid the collision in the first place. 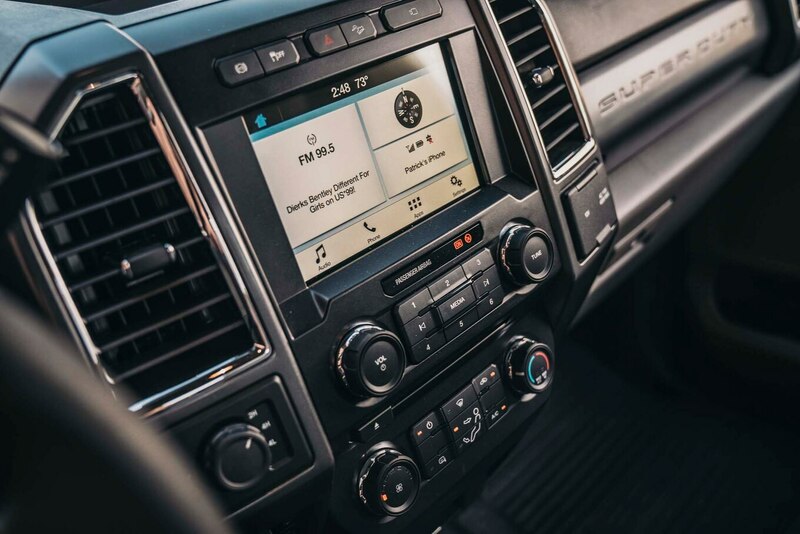 To increase your chances, Ford has added a number of features, including collision warning and automatic emergency braking. 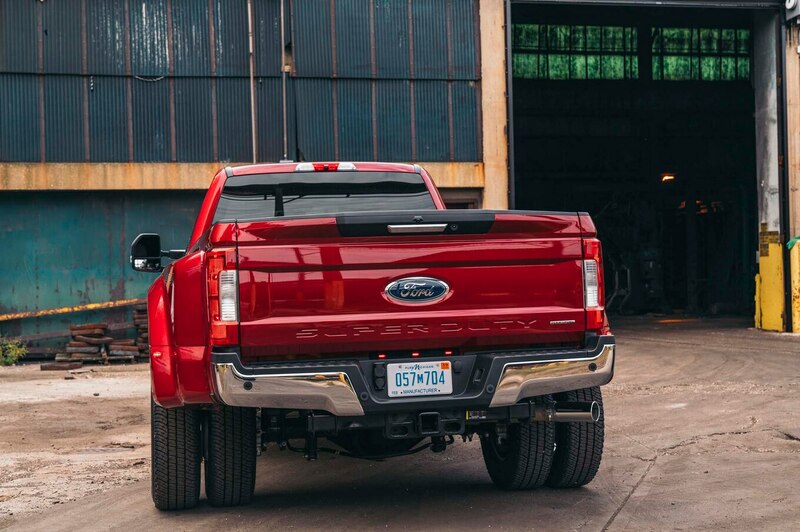 Other technologies, such as the addition of trailer sway control to the stability control software, also increase safety. 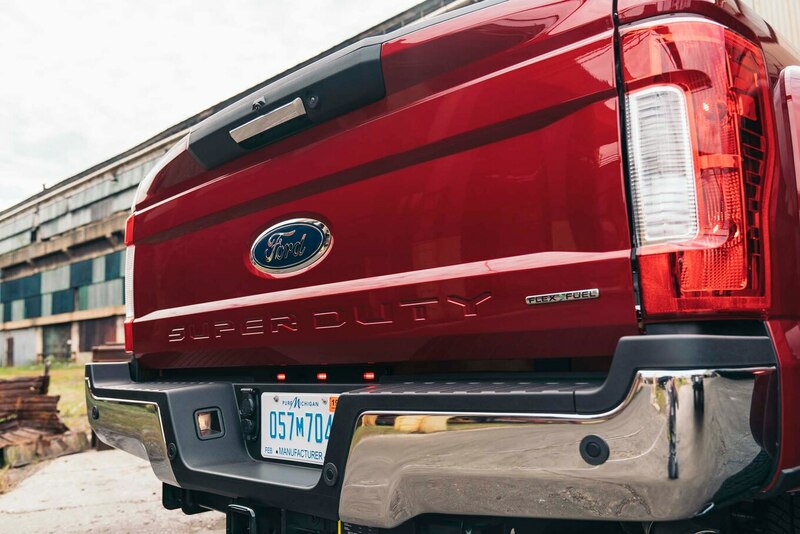 All those cameras greatly increase low-speed safety, as does the blind-spot warning system, especially when extended to cover a trailer. 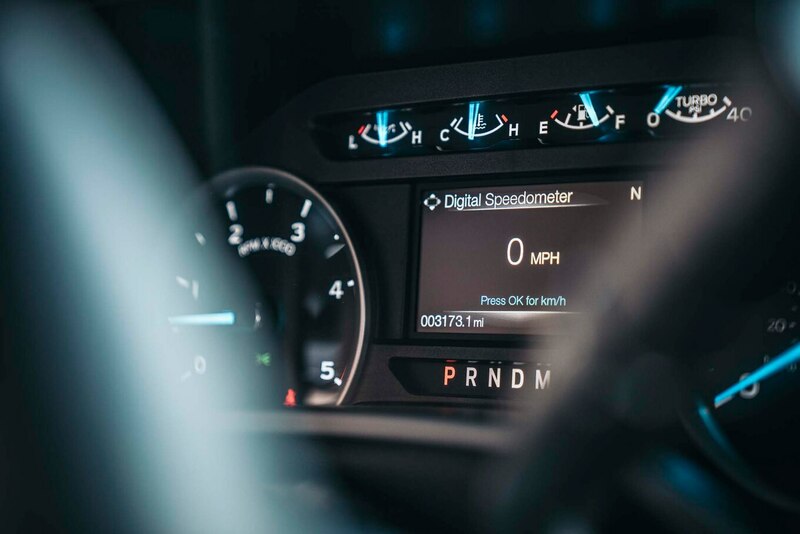 Adaptive cruise control is more than just a convenience, as it helps maintain a safe distance from the vehicle ahead both laden and unladen and impressively maintained a set speed on hill descent, even while trailering. 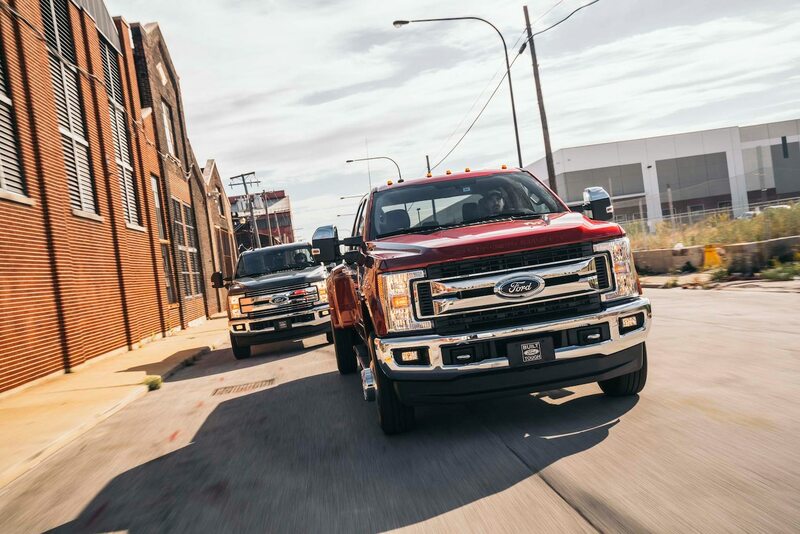 The Super Duty’s strong performance in the uphill passing while trailering test also indicate a measure of safety, as the trucks are able to more quickly remove themselves from an unsafe situation. 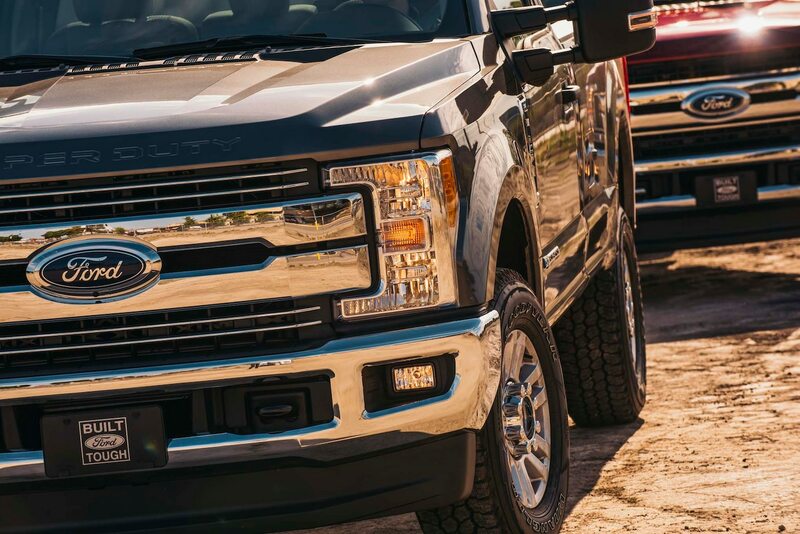 There’s no arguing that heavy-duty trucks are expensive. Regardless of make, they all start around $32,000 USD, or roughly the average price of a new vehicle in America. That doesn’t seem so bad. 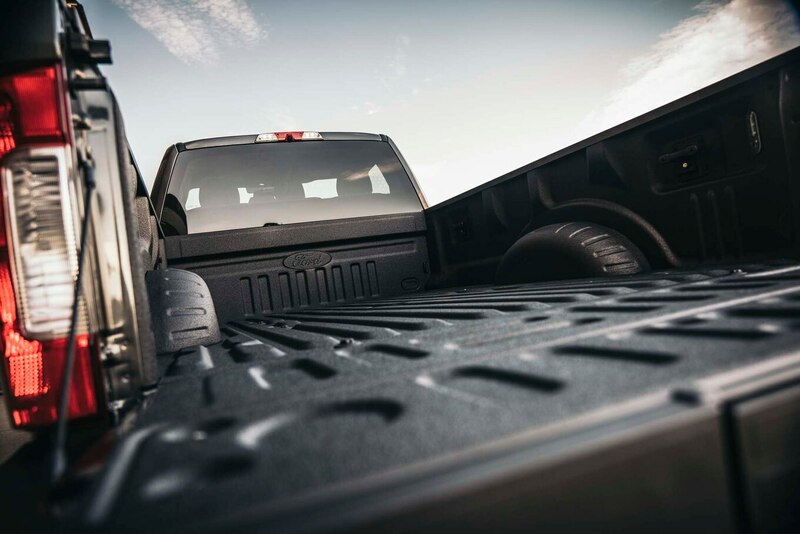 But fully loaded—and if you are using a heavy-duty truck to its capacity, you tend to load up on options—the price more than doubles. Value, then, is not synonymous with price. Rather, it is relative to the competition. 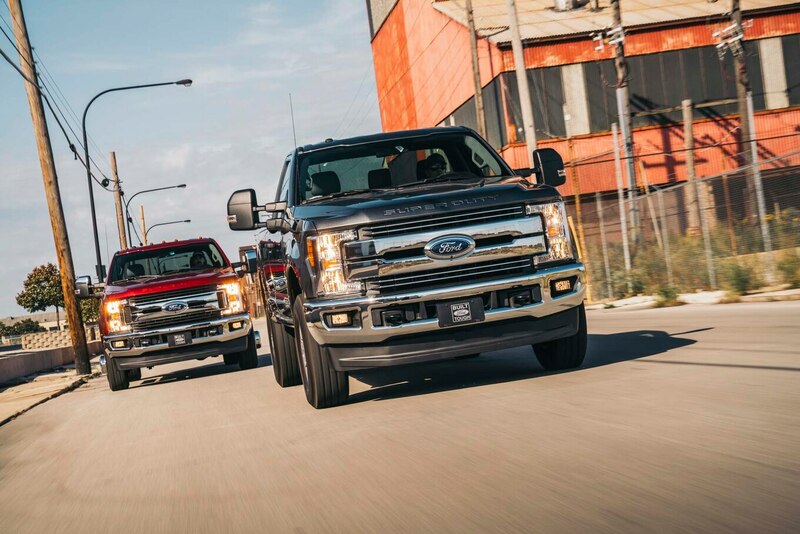 Here again, the Super Duty compares favorably. 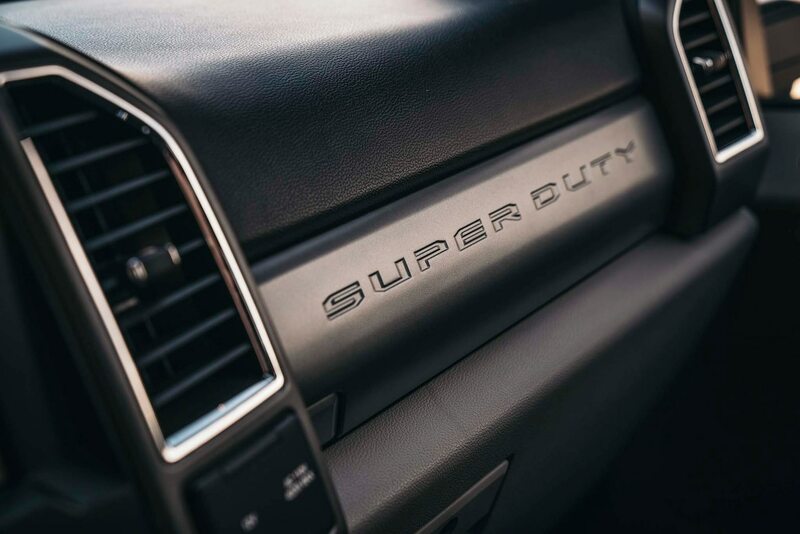 When matched with the only other equally capable truck on the market, the Super Duties are priced roughly the same or better than the equivalent Ram trim level—especially at higher trim levels. It’s more than just dollars and cents, though. The Fords offer class-leading towing and hauling. 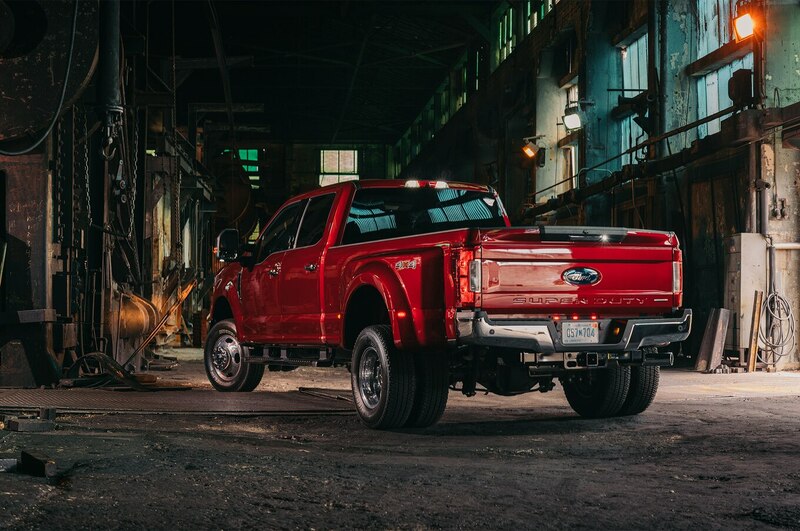 They can also be equipped with a suite of trailering technologies not offered by Ram (or, at the time of this writing, by anyone else). In terms of content per dollar spent, the Super Duties are the clear class leaders. 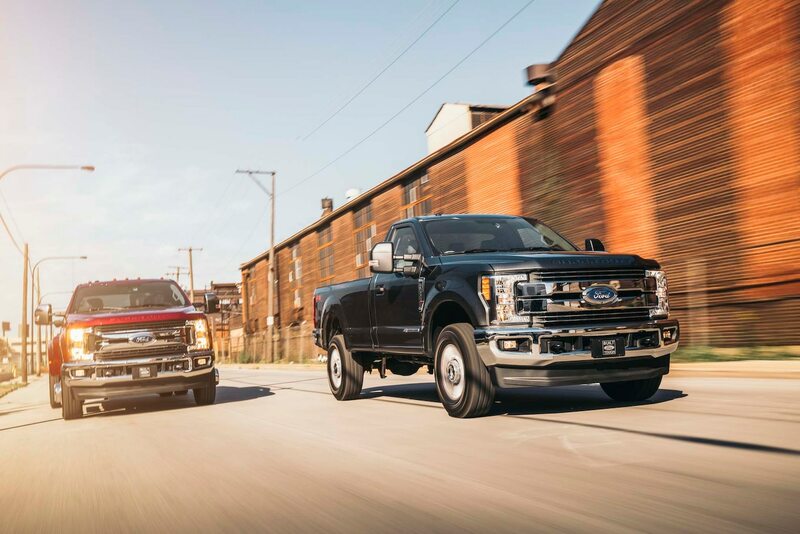 As with any Of The Year competition, Truck of the Year is not a direct comparison test. 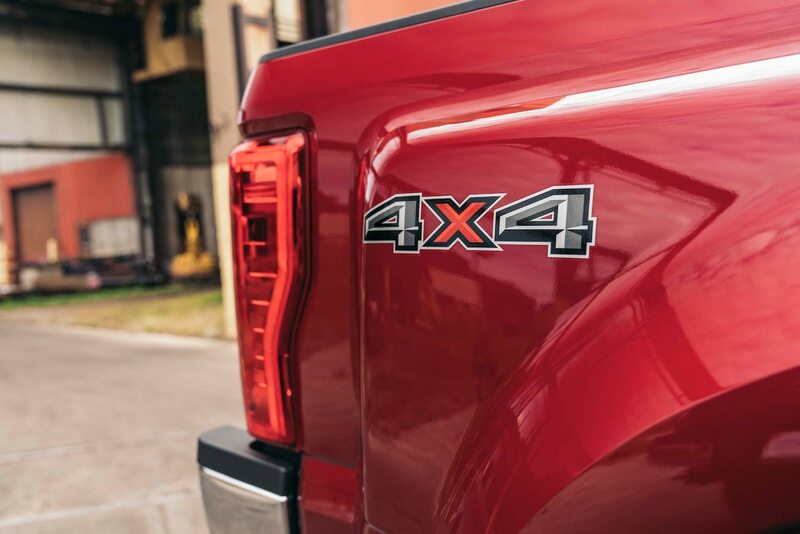 Each truck is judged against our six key criteria in the class it competes in. 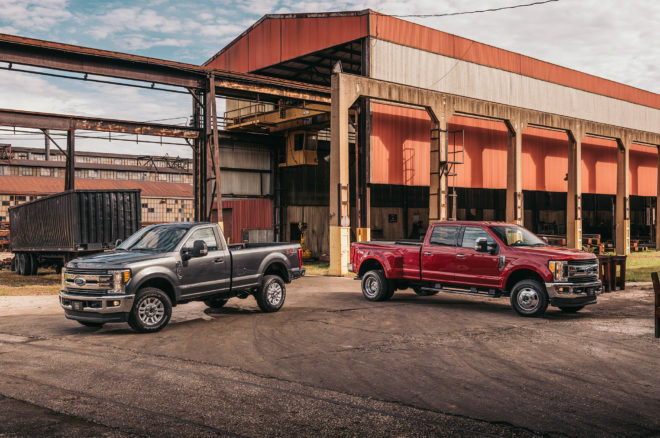 The Ford F-250 and F-350 score remarkably well on all our criteria—as well as against their direct competition. 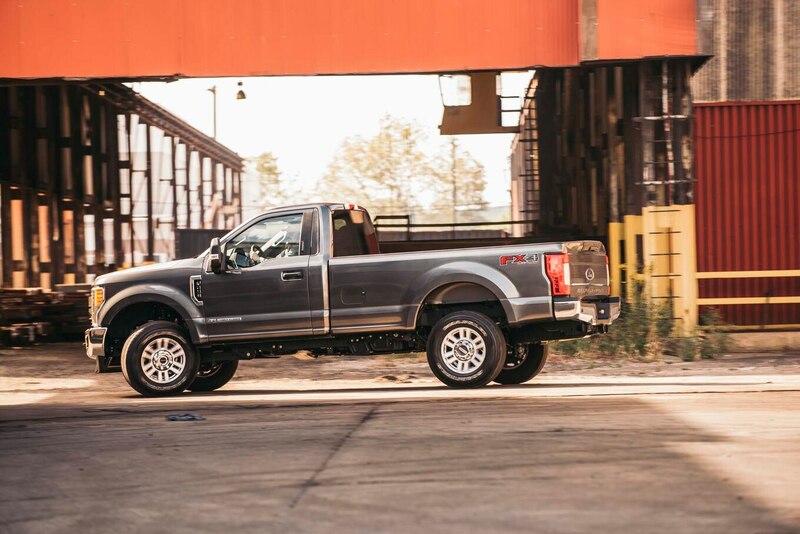 With its latest Super Duties, Ford has set new benchmarks for capability and functionality in heavy-duty pickups. 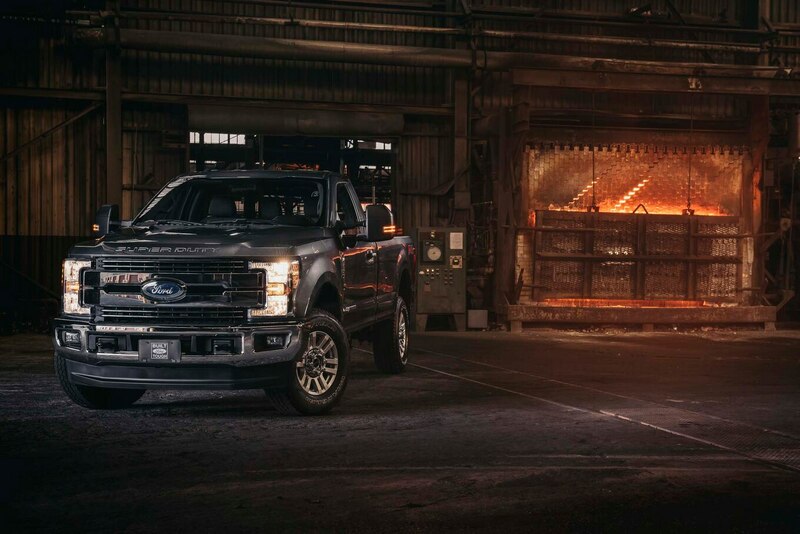 We have no doubt the competition will race to meet Ford’s new standard, both in performance and technology. Putting the competition on notice and forcing them to catch up is a hallmark of an Of The Year winner. Consider the bar raised.